Physicists, Generals And CEOs Agree: Ditch The PowerPoint : All Tech Considered A group of physicists banned PowerPoint from forums, and they aren't the only people who say we should cut back on slide-based presentations: Others include Amazon, LinkedIn and NASA. A PowerPoint slide is projected on a screen prior to a lecture at the 28th Chaos Communication Congress computer hacker conference in Berlin. About six months ago, a group of physicists in the U.S. working on the Large Hadron Collider addressed a problem they've been having for a while: Whenever they had meetings, everyone stuck to the prepared slides and couldn't really answer questions that weren't immediately relevant to what was on the screen. The point of the forum is to start discussions, so the physicists banned PowerPoint — from then on, they could only use a board and a marker. "The use of the PowerPoint slides was acting as a straitjacket to discussion," says Andrew Askew, an assistant professor of physics at Florida State University and one of the organizers of the forum at the Fermi National Accelerator Laboratory in Illinois. He says it was as if "we removed the PowerPoint slide, and like a big glass barrier was removed between the speaker and the audience. 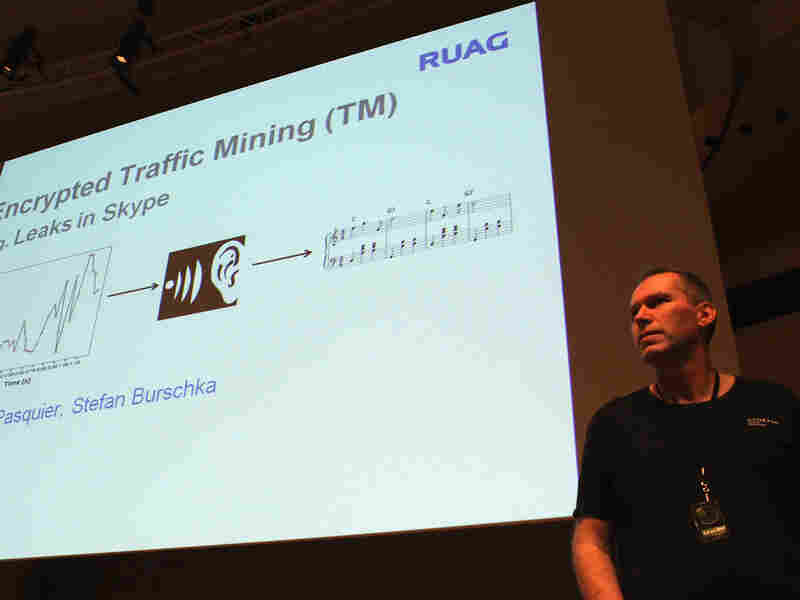 "The communication became a lot more two-way instead of just the speaker speaking at length for 15, 20 minutes. The audience really started to come alive, to look up from their laptop computers and actually start participating in the discussion, which is what we were really trying to foster." Askew admits the presentations are now considerably longer; whereas they used to do four to five each time, now they can do at most three. It's also been harder to find speakers, because now the presentations are a lot less scripted — more improv than reading from slides. But on the plus side, more physicists have started attending. The physicists are far from the only people moving away from PowerPoint-style presentations: The CEOs of Amazon and LinkedIn have eliminated the presentations from meetings. In his recently published memoir, former U.S. Defense Secretary Robert Gates calls PowerPoint slides "the bane of my existence in Pentagon meetings; it was as though no one could talk without them." Gates writes that as CIA director, he banned slides except for maps and charts, but he could not do so as Secretary of Defense. Gen. James Mattis, former commander of U.S. Central Command, has said "PowerPoint makes us stupid." Maj. Gen. H.R. McMaster banned the presentations when he led a successful mission in Iraq, and he compared PowerPoint to an internal threat. 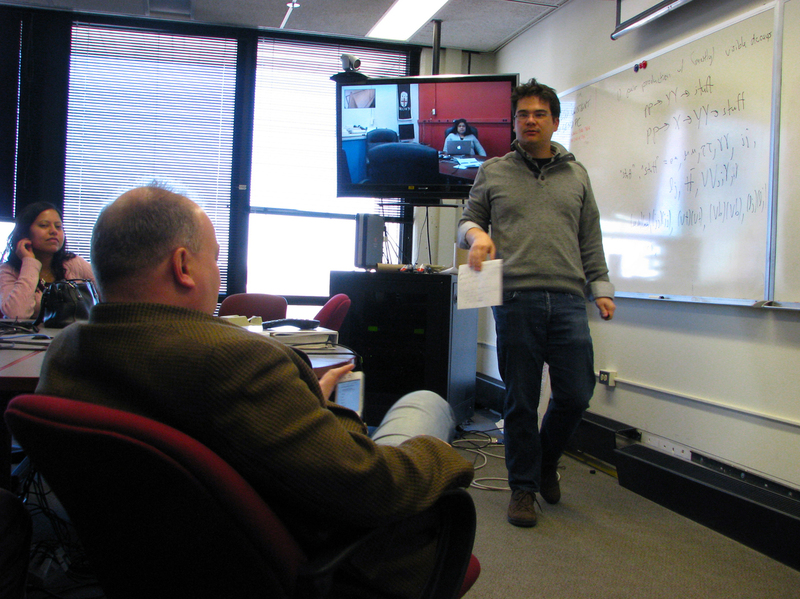 The main advantage of forgoing PowerPoint is that it forces both the speaker and the listener to pay attention, says John Paul Chou, an assistant professor of physics at Rutgers University who recently presented at one of the Fermilab forums. With PowerPoint, he says, it's "easier to let your mind go on autopilot, and you start to lose focus more easily." John Paul Chou (right), a physics professor at Rutgers University, uses a whiteboard and answers questions during a forum at Fermilab. He points out that physicists often have a lot of graphs and data to share, and with access to just a whiteboard, he has to be much more selective about what to present. He also explains that he has to make sure his audience is following his train of thought — he can't just advance to the next slide anymore. "It forces you to be a better teacher as well as making better students," Chou says. But this isn't just an issue for academics, says Richard Russell, a special adviser to U.S. Central Command who also teaches at the University of Central Florida and the National Defense University. He cites an example from the Kosovo war in 1999, when the CIA recommended a bombing run on what officials thought was a Serbian military production facility by presenting a PowerPoint slide identical to the ones used by the U.S. European Command. The chain of command thought the intelligence had been approved, the site was bombed, and it turned out to be the Chinese Embassy in Belgrade. "There are real-world consequences for this, and so it's not a purely academic, ivory tower concern," Russell says. He also points to a report from the board at NASA charged with investigating the Space Shuttle Columbia disaster of 2003. The board argued that NASA had become too reliant on presenting technical information with PowerPoint rather than reports. In a recent column for Foreign Policy, Russell writes that PowerPoint should be banned in the military education system. Of course, PowerPoint does have its advantages, says John Paul Chou of Rutgers. "If you're giving a lecture for 10 people or 100 people, you can do it very easily with a chalkboard. But once you move up to 1,000 people, you run into all kinds of technical problems that PowerPoint solves very easily," Chou says. He says the problem is simply that "we're so used to giving PowerPoint [presentations] that we forget there are other means of communicating."